I don’t have anything against McCain as a person, as I really don’t know him. In fact, I’ve never met him. Thus, I will leave his friends, family, and associates to discuss the man’s legacy from a personal standpoint after his impending death. Politically however, I do know him. And in that arena, I find him utterly disgusting. McCain is a liar. And his want to please everybody–particularly Democrats who are against him–is his weakest character flaw. And now the era of John McCain comes to an end. In this report from Newsmax, they all but say that McCain will be dead soon. McCain, 81, is battling an aggressive form of brain cancer and is recovering from treatments at his Arizona home. His eventual funeral is expected to be held at Washington National Cathedral, the Times disclosed. But there is bigger news. 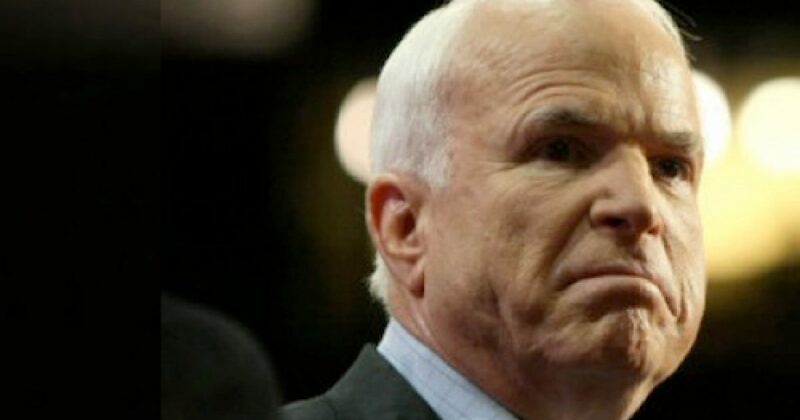 Supposedly McCain doesn’t want Trump at his funeral. Talk about a crotchety old clown. Close associates of Sen. John McCain have told the White House that they would like Vice President Mike Pence to attend the Arizona Republican’s eventual funeral instead of President Donald Trump, The New York Times reported Saturday. As if President Trump had any intentions of going? It turns out, according to the report, Trump had better things to do that day…whenever it occurs. But guess who will attend? NBC News also reported Saturday that former Presidents George W. Bush and Barack Obama are to be eulogists at McCain’s eventual service. Two presidents who will end up on the dung heap of history. I suggest McCain’s people take a lesson from the Royals, and at least cancel Barack Obama. Does the man really want to be eulogized by a deadbeat scoundrel, even if he is America’s first black president? But McCain continues his assault, as he throws Sarah Palin under the bus. McCain’s memoir — “The Restless Wave: Good Times, Just Causes, Great Fights, and Other Appreciation” — and a related HBO documentary are due out this month. In both memoirs, copies of which were obtained by the Times, McCain regrets not selecting retired Connecticut Sen. Joe Lieberman, a Democrat who later became an independent, as his 2008 running mate over former Alaska Gov. Sarah Palin. Republicans advised McCain against selecting Lieberman because his caucusing with the Democrats would have split the party, he wrote. McCain called the decision “another mistake that I made” in the documentary. While Sarah Palin may not have been the best choice for McCain, she injected life into a corpse of a campaign. Further, if McCain’s ego hadn’t gotten in the way, Palin likely could have dragged his carcass over the finish line. I’m no Palin fan, but I do see the opportunity missed by McCain and other Republicans. They could have worked with Palin to make sure she was ready for prime time. In short, Palin had it all. Gorgeous, accomplished, spirited for starters. But she appealed to all women, and could have been sold to feminists. Instead, crotchety old McCain couldn’t stand that she stole the spotlight. So he scuttled the ship. Palin now lives in relative obscurity, a footnote in history, rather than playing a significant part. Regardless, for McCain the jig is up. Depending on his birthday, he won’t see 82 years old. In fact, I suspect he’s in hospice now, and the family doesn’t want to announce it. I’m glad McCain is leaving the Senate. His ego was too big to serve the people. He proved that on far too many occasions where he pandered to the Left, and generally to make his petty points. Now Arizona has the opportunity to get a good Conservative senator. I hope Arizonans don’t screw it up.